This was a compelling film with a performance of truly breathtaking creepiness by Willem Dafoe, but if I recall correctly it just kind of trails off into artsy weirdness at the end. It's been 18 years(!) so my memory is a little faded, but I remember it feeling unresolved. 100% worth watching, if only for DaFoe's unforgettable, "I'll eat her later." I still drop that quote, when appropriate. This was my favorite film of 2000. It's an adept and unpredictable film, tense and disturbing, then funny, and transcendentally weird in places. Yet I agree that it becomes too artsy at the end. It was directed by the creator of the unforgettable "metaphysical splatter film" Begotten (film, trailer, content warning). 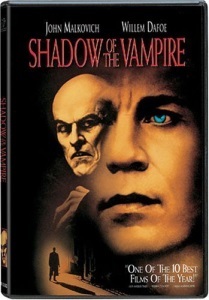 Based on the commentary track, Shadow of the Vampire was also very allegorically meaningful to him. But there's so much good stuff at the surface of this film already, I've never become interested in whatever he sees underneath. The Schnapps scene ends with one of my favorite comic moments from film in that decade. There were screams of laughter in the theater, I remember. I don't know of any other actor so reliably watchable as Willem Dafoe. (He was nominated for an Academy Award for this film, but Benicio del Toro won for Traffic instead). The high-quality writing also stands out in this scene. It's such a bummer when you see a film like this with an original premise, good structure, and juicy dialogue, and there's little else to check out by the same writer. This is one of my favourite movies ever. But it's not very well known. So if this fanfare post results in anybody to view it my goal is accomplished. So, I am a big ol' Dracula nerd and I love this movie because it irrevocably changed the way I read the interactions between Dracula and Jonathan Harker at the beginning of the book. I think about that every time I reread. This film probably pops into my mind at least once a month. "Don't eat him!" But now I wanna see it again.